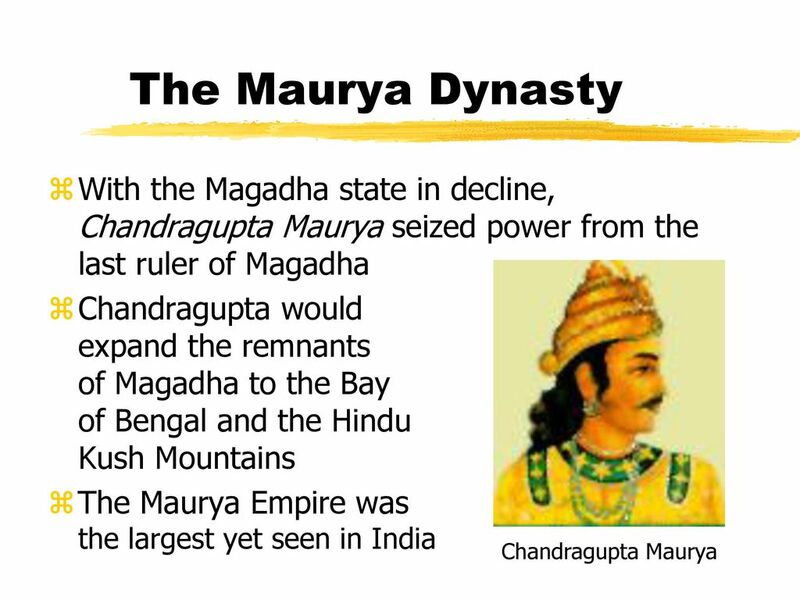 Complete Myagadha Empire covered under 7 Dynasty.We will covered all of the Dynasty in this chapter.we will discussed only important points those frequently asked in the exam. Originally founded in 566 BC by the grand father of Bimbisara named Brihdartha but actually founded by Bimbisara. 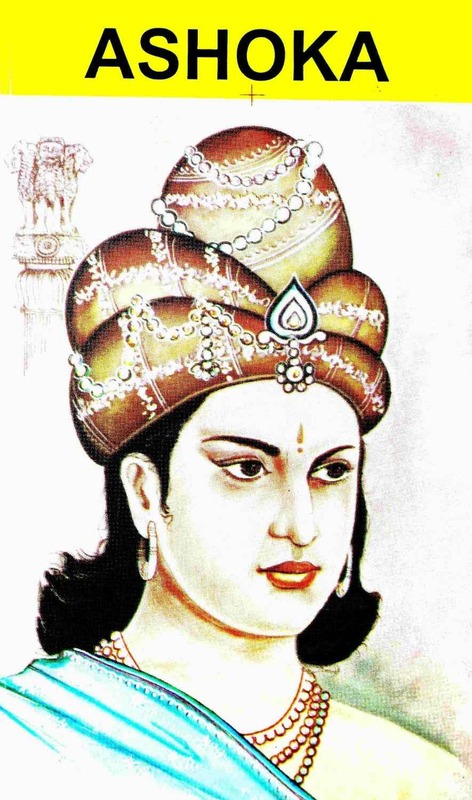 Bimbisara :Ajatshatru son of Bimbisara,killed his father and seized the throne. Udayin founded the new capital at Patliputra,situated at the confluence of the Ganga and Son. Founded by Shishunaga.He is succeeded by Kalashok,in his reign 2nd Buddhist Council held. Founder was Mahapadma Nanda. Alexander attacked India in their reign in 326 BC. Dhana Nanda was there at that time. With the help of Chanakya,known as Kautilya or Vishnugupta,he overthrew the Nandas and established therule of the Maurya Dynasty. He defeated Selucus Necator in 305 BC. A greek Ambassador Megasthenes visited his Court and finally Megasthenes wrote the book INDICA. Chandragupta was succeeded by his son Bindusara in 297 BC. Regarded as the one of the greatest kings of all times.There are 14 majar rock edict inscription, 17 minor rock edict and 12 pillar edict inscriptions.The Kalinga War 261 BC change his attitude towards life and he become a buddhist.He built Sanchi Stupa . These last there Dynasties are not important in the exam point of view.Remember only name of last Dynasty because sometimes it may asked what is the name of last Magadha Dynasty? 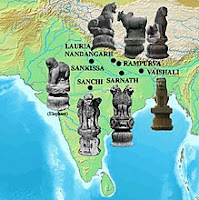 and first and last dynasty of Magadha Empire. 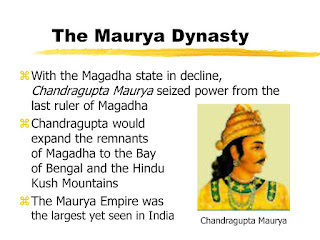 First ruller of Mauryan Dynasty-Chandragupta Maurya. who killed Bimbisara-Ajatshatru son of Bimbisara killed his own father to get the Throne. First Dynasty of Magadha Empire-Haryanka Dynasty. In next Topic we will disscussed about the Golden time of India Gupta Dynasty which is very important part of an Ancient Dynasty. Thanks guys.Hope these things helps you lot.If any issue let us know by email/comment/Contact number.